In our opinion guillermo is no longer a hurricane. 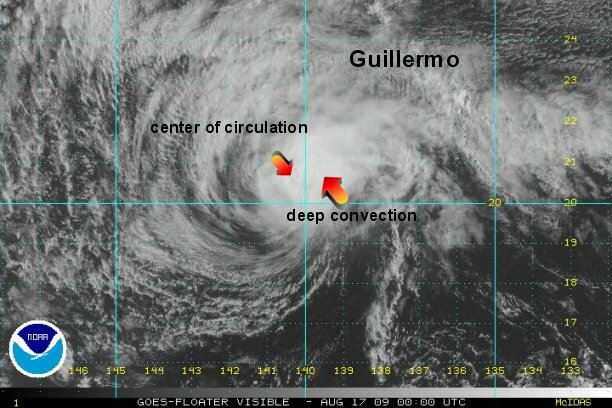 The eye of Guillermo has collapsed recently and this trend will continue tonight. 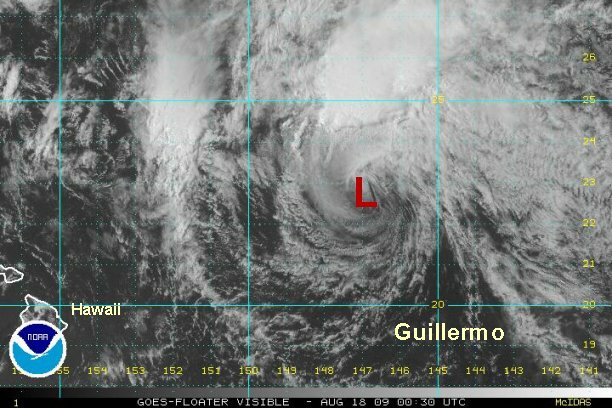 As of 8:30 pm edt / 5:30 pm pdt / 2:30 pm hst hurricane Guillermo was centered near 20.5° N / 140.3° or about 960 miles east of Hilo, Hawaii. Top sustained winds are estimated at 70 mph and decresing quickly. ( NHC had estimated 85 mph on the 5 pm edt advisory when the eye was still intact.) It is moving west at about 14 mph. Wind shear is rapidly taking its toll on Guillermo, weakening it considerably. The low level circulation is now naked, with the only convection east of the center of circuation. 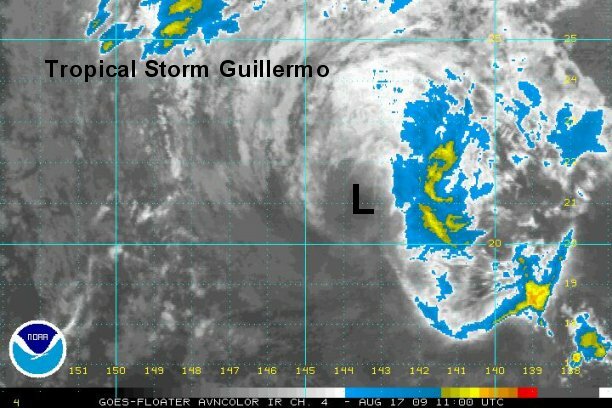 As of 7:30 am edt / 4:30 am pdt / 1:30 am hst hurricane Guillermo was centered near 21.0° N / 143.5° or about 755 miles east of Hilo, Hawaii. Top sustained winds are estimated at 45 mph and decresing quickly. ( CPHC had estimated 70 mph on the 5 am edt advisory, we think that is well over estimated.) It is moving west northwest at about 15 mph. We no longer believe that Guillermo is a tropical storm. The low center is totally exposed. Some gusts to 40-45 mph may remain well north of the center in the only convection that remains. As of 9:30 pm edt / 6:30 pm pdt / 3:30 pm hst hurricane Guillermo was centered near 22.5° N / 147.0° or 555 miles northeast miles northeast of Hilo, Hawaii. Top sustained winds are estimated at 35 mph. This will be our last update on Guillermo.